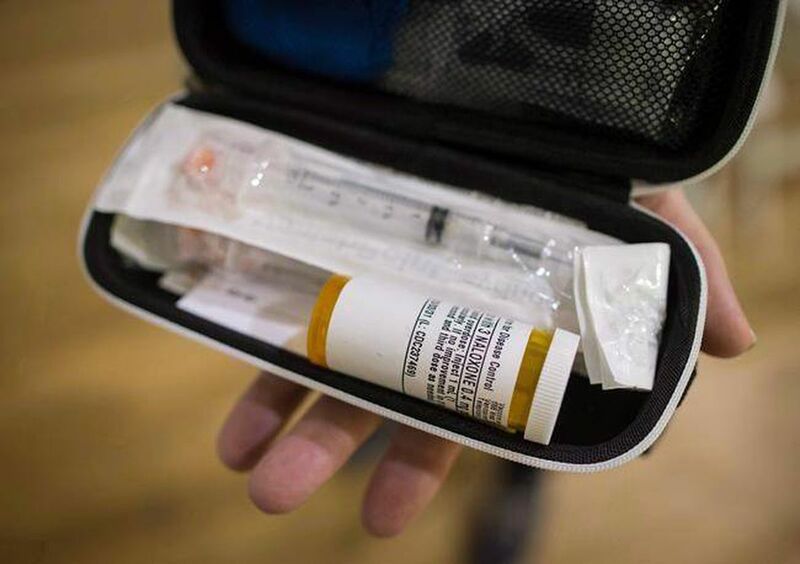 A naloxone kit is shown in Vancouver, B.C., on Nov. 13, 2017. Ontario saw a spike in opioid-related deaths for much of last year compared to 2016, according to the latest government data. The province said Wednesday there were 1,053 opioid-related deaths from January to October 2017, compared with 694 during the same time period in 2016. It also said there were there were 7,658 emergency department visits related to opioid overdoses from January to October of last year, up from 4,453 during the same time period the previous year. In December, the Public Health Agency of Canada said the number of overdose deaths for last year were expected to surpass 4,000 once all provinces reported their data, far more than the 2,861 opioid-related fatalities reported in 2016. The new figures released Tuesday came as the province said Ontario pharmacies will be providing another version of an overdose-reversing drug for free. Naloxone nasal spray will be available in pharmacies by the end of the month at no charge, in addition to existing naloxone kits that include an injectable version of the drug meant as an emergency treatment for opioid overdoses. Ontario Health Minister Helena Jaczek said the province is doing everything it can to combat what she called an "avoidable tragedy." "Our plan is absolutely addressing all aspects of this crisis. I'm confident that we're putting our resources into all the areas that are so important in addressing this public health crisis," she said. The Ontario government has pledged to spend more than $222-million over three years to tackle the growing opioid crisis in the province, with money earmarked to expand harm reduction services and hire more frontline staff. The province also said it has approved funding for seven supervised injection sites, five of which have already opened. But the opposition parties said the government has not done enough. "This crisis has been on the radar in western Canada for years, yet this government chose not to take preventive measures to protect Ontarians from the dangers of opioids," Progressive Conservative health critic Jeff Yurek said during question period. "Both the government and the previous health minister have clearly failed to properly address this crisis." New Democrat Peggy Sattler said the government should listen to frontline workers, who have called for the issue to be declared a public health emergency. Canada's chief public health officer said late last year that while a number of measures have been implemented to counteract the growing number of overdose deaths, it's likely still too early for those programs to have had much effect in reducing the number of deaths.